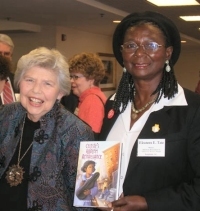 Eleanora E. Tate, the author of Celeste’s Harlem Renaissance, received the AAUW Juvenile Literature Award at a the meeting of the NC Literary and Historical Society in Asheville on Saturday. The award was presented by AAUW NC past president Elizabeth Laney. AAUW NC board member Sheila Bassoppo-Moyo attended and took these pictures. Since 1953, AAUW North Carolina has honored excellence in Juvenile Literature. This year’s winner carries on that remarkable tradition. Celeste’s Harlem Renaissance is the story of Celeste in both North Carolina and New York City in the 1920’s. Strong characterization combines with the historical backdrop to create an excellent story that opens for us a very different world — or is it so different?